Be Acne Free 1: Who wants an Acne-Prone Skin? But then, because of late night sleeps (like 3am! ), irregular menses, thick make-ups from acting, pimples start popping non-stop. It worsen at the start of this year, when my period was late for 3 weeks. You can imagine how frustrated I was. I tried many solutions, but avoiding western medicines as it usally has side effects, and the problem persists once I stop my medicine intake. I was really desperate, going for facials, massages, beauty products etc, but none really solve the root problem. I also tried taking Chinese medicine to treat my hormonal imbalance, which is super slow. I guess people with similar problems will be able to understand how I feel. So I thought I will blog about my personal experiences and journey in search of numerous and countless solutions to get back healthy skin, and hopefully, help whoever’s in the same situation as me! For people who had experienced and managed to overcome the problem, do share with me your tips! I’ve heard of how many Taiwan celebrities does acupuncture for slimming and beauty, but I never knew who are those doctors in Singapore. But thanks to a friend, I was introduced to this particular TCM (Traditional Chinese Medicine) doctor who specialise in acupuncture. Dr Chung has relocated her clinic to Chinatown with effect from January 2014 and renamed her clinic Han Dian TCM Clinic. Ms Chung Shu Feng is a fully registered TCM Physician. She attained Bachelor Degree in Traditional Chinese Medicine at Beijing at Nanjing University and Higher Diploma from Singapore College of Traditional Chinese Medicine. Ms Chung, is also a member of Herbalist Association of Singapore. So what she specialise in is to cure problems like Endocrine Disorder obesity 內分泌失調肥胖, Irregular Menstruation 月經失调, Acne Problem by using a method called Abdominal Acupuncture 腹针治疗. Part 1: Stopping the Acne from POPPING OUT! P.S This is a rather difficult post for me as I cannot photoshop any of my photos! Ahhhh…. My horrible skin! No face liao! Ok, but if I can get back my good skin, it’s gonna be worth it! Some alcohol to clean the parts she’s going to put da needles. A lot of the redness you see on my skin are the old pimple scars that has yet to recover before new pimples break out. So I’m actually a very “scar-y” girl :P. So my period was late at the time I went to see Physician Chung, so she did some acupuncture and warn me that my period might come soon. Guess what, my period came on the night I went home! Whistle Cool huh? So above are the results after 3 treatments, all within one week. The first week, my BIG BIG Pimples went down, partly because my period came too and all the toxin come out too. The physician wanted me to NOT put makeup, but it was almost not possible with me going to so many events all the time. On the third week, supposedly just before my periods again, I went back for acupuncture again. What the physician did was to treat my problem according to my menstrual cycle. With that, I hope I will get back my good skin soon! Call 6554 2048 and quote my name :Tiffany or Hui Ting 慧婷 to get free first consultation and 1 treatment. 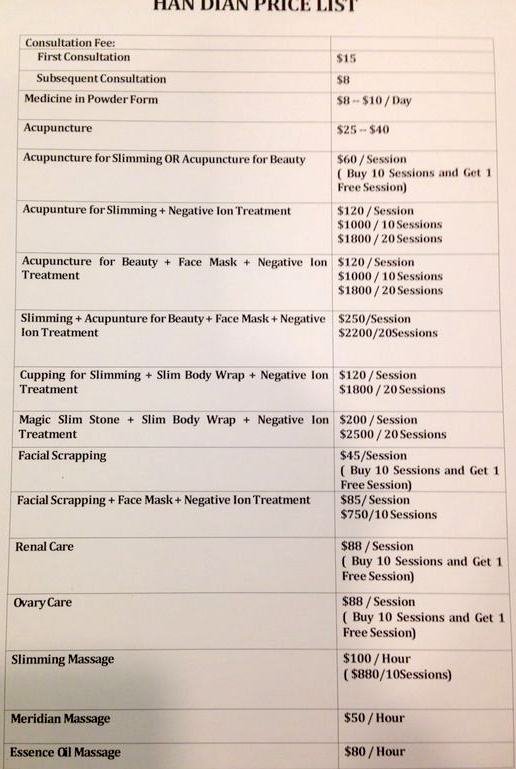 Click here to check out the Price list for other treatment sessions. Do note that the price list is accurate at the point of time of update and is subjected to change. Check out my Part 2: Drinking alkaline water… will it help me with my acne problem? Disclaimer: Please be rest assured that even though the products and services were subsidized, it does not have any bearing on the content of this post. Opinions stated are genuine and honest. Love this post! I have been having a bad acne breakouts since early this year. Gynae said it’s hormonal imbalance, and she recommended taking pills. But it didn’t clear my skin and still my period is irregular. We’re also trying for a baby so I am looking for a TCM that can help me clear my skin and balance my hormones so it’s easier to conceive. Any idea for the price range that Han Dian charges for their services? Hi Sharina, thanks for sharing! You might want to call them, quote my name and ask for their packages. Because the doctor offer different rates depending on the treatment methods! Also, with my name, you get a free consultation! So do make use of that so that you can best know how much it will cost! I am an acne victim for coming 3 months. I have tried all sort of methods, western Med, cream, laser etc. But it don’t work on me which I cannot understand why. I got the breakout out of sudden one day. I came across your blog on Han Dian TCM. Can I know if this works really? How Long does it take effect? I see from your picture that within 3 days there is already a significant difference. I am postponing my photo shoot one month later so I am at my wits end now. – Inner adjustments will take time, and the external clogging have to be removed. I have 2 recommendations, both I find pretty useful, but it really depends on your budget. b) Leatiful Home Salon (Facebook) – a home-base salon located in Jurong between Jurong East and Chinese Garden MRT which I’m currently going to but have yet to write a review for. This is so far the most effective facial I’ve gone for as I don’t get any post-facial pimples like all the other facials. For this, you can call Rina (8222 2166) and say it’s referred by Tiffany too. Thank you for sharing your experience. I have acne since 13 years old and now it has grown to adult acne with acne along mouth and jawline areas. I have had hormonal inbalances hence my period is irregular with changing period cycles. And i am looking for a good chinese sinseh that specializes in curing acne problems and chanced upon your blog. I have booked my appointment with Han Dian. I will share my experience later. Thank you! Thanks Jan, hope this will help you! I’m also returning to them. Hope to bump into you there! Hi Tiffany thnx for being candid abt ur acne experience, it’s not ez showing the world the real face sometimes. Currently I’m also having the same prob with acne….it just came rather suddenly for me, perhaps I overlooked the early signs n symptoms. Now my problem is not the red cystic type of acne but rather it’s comedones….blackheads on my cheeks n jawline n small little bumps on forehead. Like u, I tried diff things n I’m also taking chinese meds now. But it seems like 2 steps fwd, 1 step back. Saw some improvements then dunno y everyday will hv some new ones popping out. It’s UTTERLY frustrating n only ppl who hv gone thru it knows wat it feels like. I jus wanna know if this doc will b able to help clear comedones also, rather than just those red angry pimples. Do u know? And also, did ur acne return aft 2 mths of treatment? I totally understand how it feels! The same thing happened to me! Sad to say, if you wish to do it the “healthier” and non-invasive method, it is best to combine both facials AND Chinese TCM (aka acupuncture). It’s the same theory as slimming down by exercising, going for slimming treatments as well as dieting (3-in-one instead of depending on one). My acne did come back whenever my period is late OR when I have consecutive late nights, but no longer bad outbreak as I will always run to the TCM to solve it before it evolve into a bad scar. From what I know, the Han Dian TCM do provide facials, but I did not experience them myself. As for facials, I actually went to 3 different facials (some paying thousands out of my own pocket) and only Sylvia Skin Atelier managed to solved my problem. Sylvia actually helped improved my scarring problem too! I will be writing an article soon about my current combination of solution. So do look out for it soon! All in all, both Han Dian TCM and Sylvia Skin Atelier do provide some form of discounts when you quote my name, with free consultation as well. I will usually advise to go and listen first before making any decision. After-all, consultation is FREE! Hope this helps! I did a 2 month program with the doctor and my acne problem became better rapidly (partly because of balancing of the hormones- regular period etc). I did not continue from then on as I went on to facial, so I still do have breakouts whenever I have late period. So depending on the serious-ness of the problem, it might take less than 2 weeks to see effect (like the acne becoming less swollen), and up to 6 months to stablize (like completely no more acne). But this is only IF the problem is due to hormonal imbalance. A suggestion is to go get a check with the doctor (free consultation when you quote my name) before you decide whether to go ahead with treatment etc. Is there any other places you will recommend ? Are you referring to other TCM Clinic? So far, this is the only TCM Clinic I’ve tried and know that it works (for acne and weight-loss). Other TCM clinics I go to are usually for common illness. One of them is Singapore Chung Hwa Medical Institution (Free Clinic) where there is usually a long queue. You may want to check out the branches they have in Singapore. As for other acne solutions, you may want to try out Sylvia Skin Atelier (http://tiffanyyong.com/2013/07/02/be-acne-free-part3-sylvia-skin-atelier/) which got rid of my scars tremendously. While TCM is more for internal, Sylvia Skin Atelier solved my external problem! P.S. Feel free to clarify with me if you have any more questions! did the acupuncture help to get rid of your scars? Blackheads? Eh so the physician only does accupuncture or does she prescibe meds and herbs as well. I have a case of acne and constipation i would like to get treated. Hi Rizal, depending on your problem, the physician usually recommends packages. But before committing to anything, do book a free consultation to see if you are comfortable with the whole process! does the physician speak English? Hi Kenny, she does. 🙂 She’s actually the lady who will answer the call when you try to book appointment! Thanks babe! 🙂 You too!! Hi babe, came across your blog while surfing the net. How’s the results for your TCM acupuncture so far? As I’ve acne problems too and would like to visit a TCM practitioner but am not sure which one to go. Let me know your results? 🙂 Thanks! Depending on what is the root cause of your acne, I won’t guarantee anything, but I’m already getting better with no BIG acnes! BUT my period is still not regular partly because I am drinking TOO MUCH bubble tea! Hi Tiffany, thanks. I’ve called and will be going down soon. I’m actually consuming chinese medicines now, but I guess it takes time to see the results. I used to take western medicines but I realized they do thin the skin a lot. Hence I do not use them anymore as I can see my skin is getting thinner, till you can see the veins. 🙁 Also wouldn’t wanna touch Accutane as I heard there may be severe birth defects and symptoms like dryness of skin, etc.. Thanks for your advice 🙂 I will let her know about the offer. Yes! Don’t touch Accutane! I’ve tried Western meds few years back, but I realise everything comes back once I stopped the meds. I hope you can get your clear skin back soon!